Good locations, well designed Centers, strong anchors, the right type and amount of retail shop space, and an eye toward the community characterize Waters Retail Groups developed Centers. We have spent the last 30 years building a reputation with the leading national retailers and banks as Southeast Pennsylvania's top developer of "neighborhood" shopping centers. We've created thousands of jobs, generated significant tax and sales revenues and improved the local infrastructure. 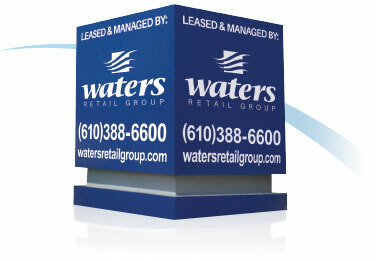 Waters Retail Group goes the “extra mile” when it comes to developing and maintaining its Shopping Centers. From buildings to signs to landscaping, everything is carefully planned and designed to complement each other. We pride ourselves on unique and attractive centers, with special architectural details such as standing-seam metal roofs, antique-style lanterns, cast-stone columns, colorful awnings, seasonal flowers, banners and flags. In addition to “curb appeal,” we are also environmentally and historically sensitive to the surroundings. We have preserved and renovated historical structures, preserved existing wetlands vegetation and wildlife through the installation of special bridges, storm-water inlets and basins, and have added special features such as “deer tunnels” and birdhouses to our developments. The company has received several awards for excellence in Property Management, and contribute regularly to the communities they are in. Our development experience spans over 30 years in Pennsylvania, Delaware, and Virginia, and continues to grow and evolve each and every day. While we are pleased by our progress to date, the future holds even more promise. We continue to apply our capabilities to develop centers and grow our real estate portfolio, and because of our experience, heavily pre-leased centers, and repeat business with long-time partners, we are able to finance property even in tough economic times. As we move forward, we remain committed to ensuring that every project is successfully completed. We continue to work every day, combining great people and great partners, to help build better centers to enhance the communities we enter.